In keeping with the "pay it forward" theme started by Dogfather Mark Gallant's Food Trucks Paying it Forward, I thought I'd tell the hot doggin' world about a guy I met on "the hot dog boards" named Bob Breault. Bob is going to enter the ranks of hot dog slingers with his new hot dog business, Dazzlin Franks. That's the short story. The (slightly but not complete) longer story about Bob follows. Bob's been a tow truck operator for 6 years or so, but he recently had wrist removal surgery (ugh), so he set out to look for a new avocation. Hot Dog Cart operator is his new chosen profession. 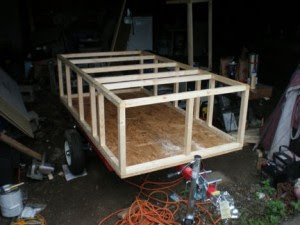 Unfortunately for Bob, his Scumbag Insurance Company left him high and dry with $16K worth of medical bills (don't get me started) and pretty much cleaned him out of funds, so he's building his own hot dog cart. As you can see, he's just getting started. Building your own cart (or buying used) is a good way to get started in the hot dog business without a lot of capital, but it's still work and it does cost money. So Bob and his Dazzlin Franks have an Indiegogo campaign going to help him raise funds for his cart build. He's not looking for a ton of cash- only about $1,500, but when you have been cleaned out by medical bills, it might as well be a million bucks! Consider Paying it Forward by slipping a future hot dog man a few bucks. Every little bit does help!